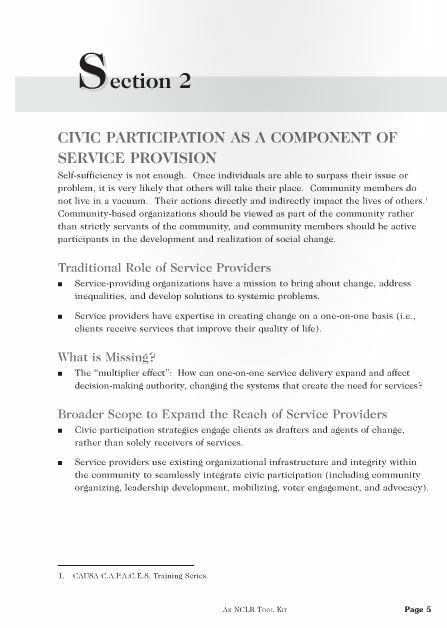 This toolkit was designed to support the NCLR Latino Empowerment and Advocacy Project (LEAP) to measurably increase Latino electoral participation, but it can be applied to any social service/social change group seeking to increase civic participation as part of their organizations work. Included are a variety of tools including surveys, intake forms, flyers, workshop guides, and petitions to assist in the integration process. National Council of La Raza is a private, nonprofit, nonpartisan, tax-exempt organization headquartered in Washington, DC, serving all Hispanic subgroups in all regions of the country. Their mission is to create opportunities and open the door to the American Dream for Latino and other families. 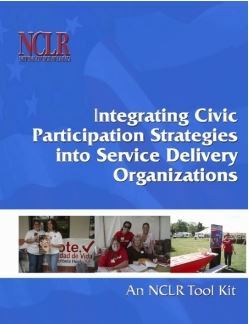 Find out more at www.nclr.org.